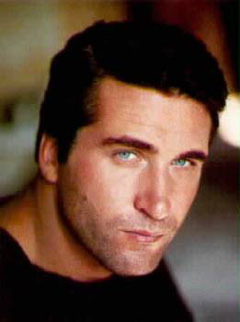 Daniel Baldwin briefly attended Ball State University, then dropped out to become a stand-up comedian. When audiences did not laugh, he became a sports handicapper, until he noticed that there was more money to be made as an actor, like his brothers Alec, Stephen, and William Baldwin. His first major role was in Too Good to Be True, an ill-advised TV remake of the noir classic Leave Her to Heaven with Loni Anderson as the Gene Tierney femme fatale, Patrick Duffy in Cornel Wilde's role, and Baldwin filling Chill Wills's part. Baldwin was a regular on the sitcom Sydney starring Valerie Bertinelli as a put-upon private eye, Matthew Perry as her kid brother, and Baldwin as "Cheezy", the somewhat crude fellow who was always propositioning her to no avail. He played the henchman to Tom Sizemore's villain in Harley Davidson and the Marlboro Man, and had his first starring role in the pilot for Ned Blessing, a TV western. When the series was picked up, though, Baldwin walked away from the part (Wes Studi starred instead) to take a role on the more prestigious Homicide: Life on the Street. As Detective Beau Felton on that ensemble cop show, given good scripts and competent co-workers like Ned Beatty and Yaphet Kotto, Baldwin proved a perfectly adequate actor. But after two seasons on Homicide Baldwin left the show, and its producers made his exit final by having his character's headless body discovered in a later episode. Baldwin's career as a major league actor basically ended when he left Homicide. He had a small role in the stylish thriller Mulholland Falls with Nick Nolte, and he played the assistant to vampire hunter James Woods in John Carpenter's Vampires. Baldwin has continued to work, albeit almost exclusively in obscure, low-budget films, including Donny Most's Searching for Mickey Fish, King of the Ants with George Wendt, and The Beach Party at the Threshold of Hell. He starred in the Sci Fi Channel's Anonymous Rex with a faded Faye Dunaway, and he has directed two films, both starring himself in action mode, Tunnel with Janine Theriault and Fall with (ambiguous link, Steve McQueen)'s son Chad. In 1998, Baldwin was found running naked through the halls of New York's Plaza Hotel, and arrested for possession of cocaine. He pled guilty to disorderly conduct and was sentenced to three months in drug rehab. He later told People magazine he had been battling a cocaine addiction since 1989. In 2005, Baldwin competed on VH1's Celebrity Fit Club, a reality show wherein overweight, washed-up semi-celebrities compete against each other to see who can lose the most weight. Baldwin's teammates were miffed when he missed one week's weigh-in after checking into rehab again. He returned to the show, apologizing for his absence, then disappeared again. In April 2006, Baldwin was arrested in a Santa Monica hotel for possession of cocaine. In July 2006 he was injured and briefly hospitalized after running a red light at 80 miles per hour and crashing his Ford Thunderbird into two parked cars. His drivers' license was reportedly already suspended at the time of the accident. In November 2006 he was arrested for stealing a car, and charged with drug possession after a police search of his hotel room uncovered a stash of narcotics.